George Retos Jr., a 69-year-old businessman and former lawyer who lives in the Pittsburgh, Pa. suburb of East Washington, was a big, big fan of Las Vegas. 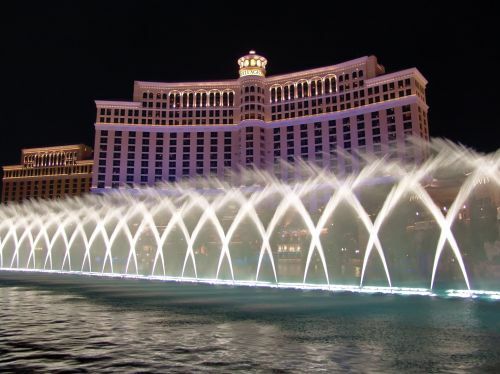 He especially liked visiting the Bellagio, the giant Strip casino hotel known for its spectacular fountain displays. Another favored place was the Cosmopolitan, the trendy casino hotel that frequently tops best-places-to-stay lists. He used debit cards to run up personal charges at both facilities. But there was a big problem with this–if federal prosecutors in Pittsburgh are to be believed. The mention of federal prosecutors might make it possible for you to sort of guess where I’m going with this. According to a 32-page federal indictment issued last month, Retos orchestrated several schemes to misappropriate the proceeds of federally guaranteed loans made to several private businesses he controlled in the plastics industry and to evade taxes “for his own personal use and the use of his family members.” The Las Vegas expenditures are identified as part of this effort. The 13 counts in the indictment include wire fraud, tax evasion, and conspiracy to defraud the U.S. government. There are some other interesting charges, too, including false bankruptcy declarations and possession of a handgun despite being a long-convicted felon. While the court is sorting this all out, I am nominating Retos for my list, It Didn’t Stay Here. The roster consists of folks in trouble elsewhere for something that happened in that Mecca of Mischief called Las Vegas. My list is a New To Las Vegas rebuttal of that famous Las Vegas Convention and Visitors Authority marketing pitch, “What Happens Here, Stays Here.” Other nominees can be found on this page. By clicking on their names, you can learn their sad stories, too. Some information also comes from extensive media coverage Retos has received over the years for this and other matters. These media outlets include the Pittsburgh Post-Gazette, the Pittsburgh Tribune-Review (whose Web headline on the story about the charges read, “Feds: East Washington man evaded taxes to finance gambling habit”) and his hometown newspaper, the Observer-Reporter. According to the indictment, Retos controlled three inter-connected companies in Washington, Pa., Prime Plastics Inc., Plastic Power Inc. and Branikas Investments LLC. In 2008 the companies received $2 million in federally guaranteed loans from a third-party lender. The feds said Retos agreed that the funds would only be used for working capital and proper business purposes. Instead, say court filings, he set out with the help of unidentified conspirators to loot the businesses. On June 4, 2011, he used a Prime Plastics debit card to make a purchase of $4,657.20 at the Bellagio. Four months later, on October 3, he made another debit card purchase at the Bellagio for $5,174.15. April 1, 2013–April Fool’s Day–was a big day on the Strip for Retos, according to the indictment. He used debit cards issued to his businesses to spend $1,969.89 at the Bellagio and $1,042.00 at the Cosmopolitan. Two days later, he spent $2,485.33 at the Bellagio and $1,1326.12 at the Cosmopolitan. These Las Vegas expenditures may not seem like big bucks. But they came amid transfers to other Retos bank accounts and debit card charges at a Pennsylvania racetrack and casinos outside Nevada. As it happened, Retos personally owed about $1 million in unpaid federal income taxes from 1987 to 2008. The indictment says Retos tried to evade paying the taxes by hiding his ownership in the companies and using corporate funds to finance his lifestyle. It would appear that authorities had their eye on Retos for a long time. In the 1990s, according to news accounts and court records, he went to prison for tax evasion, mail fraud and interstate transportation of stolen property. That seems to be why he lost his license to practice law, and also why he now faces a felon-in-possession-of-firearm-and-ammunition charge (a .38 caliber semi-automatic Kel Tec pistol and hollow-point bullets, if you want to know). Besides the criminal stuff, over the years scores of civil lawsuits have been filed against him in his home county. The plaintiffs generally were lenders (including an ex-girlfriend’s mother), creditors and government agencies claiming they weren’t paid monies owed. I saw no lawsuits from Las Vegas casinos, which unlike the locals apparently were smart enough to not extend him credit. This man is the scum of the earth. His lowlife ex-wife, and his criminal drug addict adult kids are all horrible too. The hateful jealous daughter is the worst. Evil, tried to murder a former girl friend of Retos, while on probation. This county is as corrupt as he is. They all need to go down…together.